The Sprinkler Key Holder is made from a real sprinkler system head so it looks real and no one will ever suspect your hiding place. Whether you are keeping an extra key handy for yourself or leaving money or small documents for someone else this is the ideal outdoor safe spot. 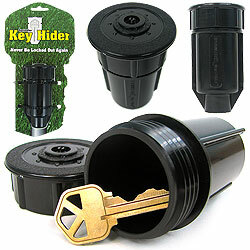 The Sprinkler Key Hider is waterproof and virtually indestructible!Features include:Realistic look - made from a real sprinkler headWaterproof and virtually indestructableEnough room for keys spare money or a small documentOnly you will know where it is!Measures 2 x 2 x 3. 75 inches Dimensions (L x W x H): 2 x 2 x 3.75 inches..
We offer high-quality products at amazing prices, from 30-70% off MSRP every sale, every day.This Discrete Sprinkler Head - Hide A Key - As Seen On TV is of the highest quality. This item is currently available for the everyday price of $18.19, a discount of 5% off the list price. Can't decide? UnbeatableSale.com gift certificates are always just right! We hope you will enjoy your shopping experience with UnbeatableSale.com. If you have any questions or comments, please see our contact page for information on how to reach us.